Philadelphia, PA – April 18, 2017 – Today, Janney Montgomery Scott LLC (“Janney”), a leading full-service wealth management, financial services and investment banking firm headquartered in Philadelphia, PA, bolsters its management team with the promotion of four leaders. Joseph D. Culley, Jr. has been promoted to Head of Capital Markets and will join Janney’s Executive Committee. Formerly, he held the position of Head of Equities and Investment Banking. In this new capacity, Mr. Culley will oversee the firm’s Equities, Fixed Income and Investment Banking operations. 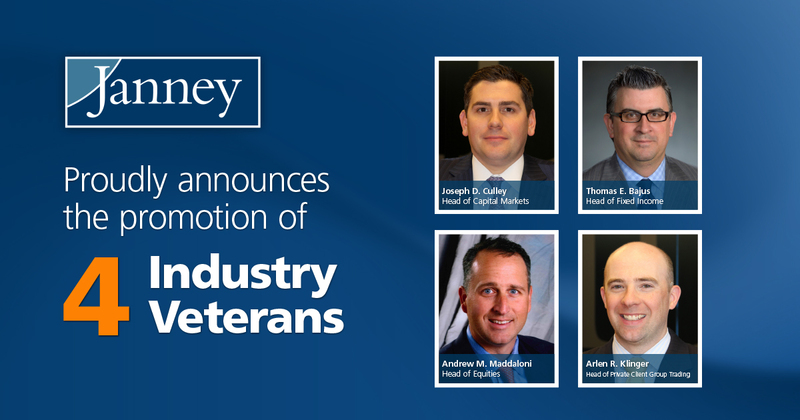 Additionally, Thomas E. Bajus has been promoted to Head of Fixed Income, Andrew M. Maddaloni has been promoted to Head of Equities, and Arlen R. Klinger has been promoted to Head of Private Client Group Trading.